Make your job easier by simplifying storage provisioning and management for vSphere. Deploy storage with just a few mouse clicks from the vSphere Web Client and enjoy native integration with the VMware stack. Virtual machine-centric storage policies automate storage services levels on a per-VM basis. Customers of all industries and sizes trust Virtual SAN to run their business-critical workloads, from key business applications to thousands of virtual desktops. Virtual SAN ensures that data is never lost if a disk, host, network or rack fails and can even tolerate entire site failures with synchronous replication and stretched clusters. Built on an optimized I/O data path in the hypervisor and designed for flash speeds, Virtual SAN delivers much better performance than a virtual appliance or external device. Experience up to 100,000 IOPs per host with all-flash and scale up to 64 hosts per cluster—a perfect match for virtual desktops, remote IT and business critical applications. Trust your mission-critical applications with the only hypervisor-embedded storage solution. Virtual SAN delivers all-flash performance with up to 100,000 IOPs per host, support for vSphere availability technologies like High Availability (HA), asynchronous replication, stretched cluster capabilities, and storage efficiency features for all-flash including deduplication, compression and erasure coding. Virtual SAN delivers predictable, elastic and non-disruptive scaling of storage and compute resources, eliminating costly forklift upgrades. Every Virtual SAN cluster can scale out one node at a time or scale up by adding capacity to existing hosts and is capable of achieving over 8 PB of raw storage capacity. Virtual SAN is the only hyper-converged storage solution delivered directly from the hypervisor, resulting in a flash-optimized architecture that delivers as much as 100,000 IOPS per all-flash node. Leverage the shortest, most efficient I/O data path for optimized performance with the least impact on CPU and memory resources. Deploy an all-flash architecture with flash-based caching and SSD data persistence to provide up to 100,000 IOPS per host with consistent, low latency. Improve virtual machine performance and minimize storage latencies by caching and accelerating read/write disk I/O traffic through enterprise-grade, server-side flash cache. Automatically rebuild and rebalance storage to align with the storage service levels assigned to each virtual machine in the cluster. Automatically limits and monitors the IOPS consumed by specific virtual machines, eliminating noisy neighbor issues. Virtual SAN enables the most cost-efficient all-flash performance by delivering up to 10x greater storage utilization through data reduction technologies to optimize data footprint. Optimizes all-flash storage capacity with as much as 7x data reduction while having minimal impact on server CPU and memory resources. Increases usable storage capacity by up to 2x with the same high levels of data resiliency. Tolerate one or two failures with single parity or double parity protection. Virtual SAN delivers enterprise availability for the most demanding business critical applications, capable of delivering 99.999% uptime and beyond with built-in and tunable failure tolerance settings. Maximize resiliency with built-in distributed RAID, cache mirroring, and per-VM control by specifying how many host, network, disk, or rack failures to tolerate. Enable enterprise-level availability that ensures no data loss and near zero downtime even in the event of an entire site failure with synchronous replication between two data centers. Leverage core vSphere features such as High Availability (HA) and Distributed Resource Scheduler (DRS) along with vSphere snapshots and VMware Site Recovery Manage. vSphere Replication for Virtual SAN provides asynchronous VM replication with RPOs of up to five minutes. Virtual SAN provides the simplicity of managing storage along with compute and networking in a single, tightly integrated interface–the vSphere Web Client. Eliminate the need for training on specialized storage interfaces and tools by using vSphere Web Client-based management to provision storage in two clicks. Deploy storage policies with a single click to automatically provision storage resources–no LUNs or RAID configurations necessary. Perform hardware, firmware, and driver compatibility checks directly from the vSphere Web Client, along with real-time diagnostics and reporting on performance and storage capacity. Virtual SAN is radically simple, enterprise-class software-defined storage powering VMware hyper-converged infrastructure. Get started by learning about Virtual SAN at your own pace or learn with us. We offer a variety of ways to experience the benefits of hyper-converged infrastructure (HCI) and Virtual SAN, from live webinars to self-paced on-demand courses. Check out our blog for the latest news and technical insights about hyper-convergence, software-defined storage and many related topics. View a technically-oriented introductory video on the capabilities of Virtual SAN and what it can do for you. Test drive Virtual SAN today with our on-demand Hands-on Lab. No installation required. Watch three minute, bite-sized tutorials to get started with different concepts like disk management, snapshots, operations management, and more. Subscribe to our YouTube channel to get notified of new videos and content. Take this self-paced 60 minute course to understand the key benefits, features, architecture and primary use cases of Virtual SAN. Take this three-day instructor led course on the features, functionality and on-going management and control of Virtual SAN. Courses are also available in a live online format. Our classes are available worldwide in eLearning, instructor-led or on-demand formats. Validate Virtual SAN’s benefits to your organization through hardware guidance, sizing recommendations and a TCO analysis specific to your environment in as little as seven days. What are the requirements for running Virtual SAN? Virtual SAN has specific requirements for hardware (hosts, CPU, memory, number & type of storage devices), software (version of vCenter, vSphere configuration, ESXi host version & configuration), and networking. In traditional configurations, Virtual SAN requires 3 hosts, with at least one disk group each, configured in a vSphere Cluster with Virtual SAN enabled, with a VMkernel port configured for Virtual SAN traffic that has connectivity to other hosts in the cluster. Note* Multicast traffic is required. More detailed information for the different versions of Virtual SAN can be found in the relative KB article for each version of Virtual SAN. What type of hardware is required for Virtual SAN? Hosts that are certified to run VMware vSphere along with components that are certified to run Virtual SAN. Components certified for Virtual SAN are tested by the VMware Storage and Availability Business Unit. Virtual SAN can be installed on hardware in a bring your own component, Ready Node, or Engineered Appliance offering. The VMware vSphere Hardware Compatibility List details which hosts and CPU configurations are supported with ESXi. When combined with the vSphere HCL, the Virtual SAN Compatibility Guide provides a list of hardware certified to run Virtual SAN. Ready Nodes are a pre-validated hardware options from various OEMs. Warning: Using uncertified hardware may lead to performance issues and/or data loss. The reason for this is that the behavior of uncertified hardware cannot be predicted. VMware cannot provide support for environments running on uncertified hardware. What are the cluster requirements of Virtual SAN? A minimum of 3 nodes must contribute storage, unless using a 2 Node configuration along with an external witness. 2 Node configurations were introduced in Virtual SAN 6.1. All ESXi hosts must be managed by vCenter Server 6.0 and configured as a Virtual SAN cluster member. vCenter Server must be at a release level equal to or higher than the ESXi hosts it is managing. ESXi hosts in a VSAN cluster may not participate in any other cluster. What are the memory requirements of Virtual SAN 6? Memory requirements are determined by the number of disk groups and devices that are managed by ESXi. Hosts should contain at least 32GB of RAM to accommodate the maximum number of disk groups and devices. BaseConsumption: This is the fixed amount of memory consumed by Virtual SAN per ESXi host. This is currently 3 GB. This memory is mostly used to house the VSAN directory, per host metadata, and memory caches. NumDiskGroups: This is the number of disk groups in the host, should range from 1 to 5. DiskGroupBaseConsumption: This is the fixed amount of memory consumed by each individual disk group in the host. This is currently 500 MB. This is mainly used to allocate resources used to support inflight operations on a per disk group level. SSDMemOverheadPerGB: This is the fixed amount of memory we allocate for each GB of SSD capacity. This is currently 2 MB in hybrid systems and is 7 MB for all flash systems. Most of this memory is used for keeping track of blocks in the SSD used for write buffer and read cache. SSDSize: The size of the SSD in GB. KB Article 2113954 provides scenarios to better illustrate Virtual SAN memory requirements. What are the processor requirements? Processors that are approved on the vSphere Compatibility Guide are approved for use with Virtual SAN. Virtual SAN typically consumes no more than 10% of CPU overhead per host for versions up to 6.1. When using advanced Space Efficiency features in All-Flash architectures of Virtual SAN 6.2, may consume an additional 5% of CPU. VMware vCenter Server must be at the same version or higher than the ESXi hosts it is managing. ESXi hosts that participate in Virtual SAN Clusters must be version 6.0. ESXi hosts participating in a VSAN 6.0 cluster must be running the same ESXi version. Hosts versions may be mismatched during the duration of an upgrade. When upgrading from Virtual SAN 5.5 to 6.0, the on-disk format must be upgraded to use all available features for the specific edition of Virtual SAN. The VSAN-FS format for Virtual SAN 6.0 and 6.1 must be 2.0 to use all features of each edition. 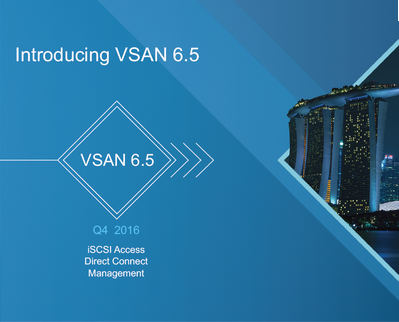 The VSAN-FS format for Virtual SAN 6.2 must be 3.0 to use all features of 6.2. For hybrid configurations, each host must have a minimum of a single physical 1 GB Ethernet NIC available solely for Virtual SAN use. For all flash configurations, each host must have a minimum of a single physical 10 GB Ethernet NIC available for Virtual SAN use. This NIC can be shared with other traffic. Layer 2 multicast must be enabled on the physical switch connecting all hosts in the VSAN cluster. Layer 3 multicast is supported. Each ESXi host in the cluster must have a vmkernel port, regardless of whether it contributes to storage. For more information, see the Set Up a VMkernel Network for Virtual SAN section in the VMware Virtual SAN 6.0 Documentation. Note: When running multiple Virtual SAN clusters, it is required to have isolated Virtual SAN networks. KB Article 2075451 covers setting Multicast addressing in Virtual SAN. For more information, see Networking Requirements for Virtual SAN section in the VMware Virtual SAN 6.0 Documentation. What are the storage requirements for Virtual SAN 6? At least 1 SAS/SATA Solid State Drive (SSD), PCIe flash disk, or other supported caching device. Hybrid configurations will use 70% of the capacity of each caching device will be used for read caching. Hybrid configurations will use 30%* of the capacity of each caching device will be used as a write buffer. All-Flash configurations will use 100%* of the capacity of each caching device will be used as a write buffer. Hosts running in a hybrid cluster configuration must have at least 1 SAS, NL-SAS or SATA magnetic Hard Disk (HDD). A SAS or SATA Host Bus Adapter (HBA), or RAID controller that is set up in non-RAID (pass through) or RAID 0 mode. The HBA/RAID Controller must meet a minimum queue depth of 256. The Virtual SAN Compatibility Guide details recommendations for each certified controller. Controller cache should be disabled or configured for 100% read. When booting a Virtual SAN 6.0 enabled ESXi host from a USB or SD card, the size of the disk must be at least 4 GB. When booting a Virtual SAN host from a SATADOM device, you must use a Single-Level Cell (SLC) device and the size of the boot device must be at least 16 GB. Virtual SAN requires exclusive access to the local disks in the ESXi host. Virtual SAN disks cannot be shared with another file system, such as Virtual Flash File System (VFFS), VMFS partitions, or an ESXi boot partition. Do not format storage devices with VMFS or any other file system. Ensure flash storage is not claimed by vSphere Flash Read Cache. If you install ESXi on a USB or SD device and allocate all local storage to Virtual SAN, you do not have any local disk or datastore available for persistent logging. Configure a Dump Collector and a Syslog Collector to direct ESXi memory dumps and system logs to a server on the network, rather than to a local disk. For information, see the Configure ESXi Dump Collector with ESXCLIsection in the http://pubs.vmware.com/vsphere-60/topic/com.vmware.vsphere.install.doc/GUID-85D78165-E590-42CF-80AC-E78CBA307232.htmlvSphere Installation and Setup guide. What are the licensing requirements for Virtual SAN 6? Virtual SAN may be used with any edition of vSphere. It is licensed by method and edition. 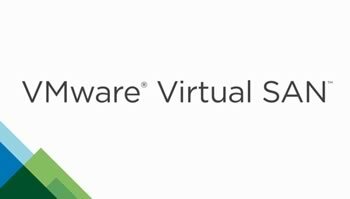 Virtual SAN Advanced Edition licensing is included in VMware Horizon Advanced & Enterprise Suites. The capacity of the license must cover the total number of CPUs in the cluster. Introduced in Virtual SAN 6.1, this edition allows for up to 25 virtual machines to be licensed at a remote or branch site. ROBO licensing does not limit the number of hosts in the cluster, but rather the number of virtual machines to 25 per site. A single Virtual SAN ROBO license can be spread across multiple sites, up to the 25 virtual machine limit. More than total 25 virtual machines across multiple sites require additional ROBO licenses for each multiple of 25, with no more than 25 in a single site.